Bakers Complete Puppy is a compete food suitable for puppies aged between 6 weeks and 24 months. It has been specially developed to provide a complete balance and delicious taste to provide your puppy with all of the nutrition he needs to grow healthily. Puppies burns 2-3 times as many calories as adult dogs and therefore needs the best nutrition available. The food contains high levels of protein to support growth, high levels of minerals (eg. calcium and iron) and Vitamin D which will help to support strong bones and teeth. The kibbles are small to help your puppy to chew and digest the food more easily. Cereals (25% ), Meat and animal derivatives ( 26% meat in the chunk, 4% beef in the brown kernels), Vegetable protein extracts, Oils & fats, Various sugars, Derivatives of vegetable origin, Minerals, Vegetables ( 4% vegetable in the green & yellow kernels). Cereals (25%) Meat and animal derivatives ( 26% meat & 4% chicken in the chunk), ), Vegetable protein extracts, Oils and fats, Various sugars, Derivatives of vegetable origin, Minerals, Vegetables (4% vegetables in the green & orange kernels). Milk & milk derivatives (4% skimmed milk in the bone kernel). Mn(E5): 7.5 ; Zn(E6): 180 ; Se(E8): 0.24. Mn(E5): 7.5; Zn(E6): 180; Se(E8): 0.24. The recommended daily amounts should be adjusted according to weather conditions, the animal’s level of activity and its physical condition. These amounts are based on moderately active dogs based on normal environmental temperatures. One half pint mug contains approximately 100g of Bakers Complete® Puppy. The daily amount of Bakers Complete Puppy food shown should be given as 3-4 meals under 3 months of age, 3 meals at 3-6 months, and 2 meals over 6 months of age. For young puppies it is recommended that the food be moistened with water prior to feeding. As all dogs grow and mature at different rates, depending on breed and also their individual metabolism, their nutritional requirements will vary. Small breeds mature at 10-12 months of age, while giant breeds may not mature until 24 months. As each puppy is different, you might have to adjust the feeding amounts in order to maintain your puppy at a lean, healthy body weight. 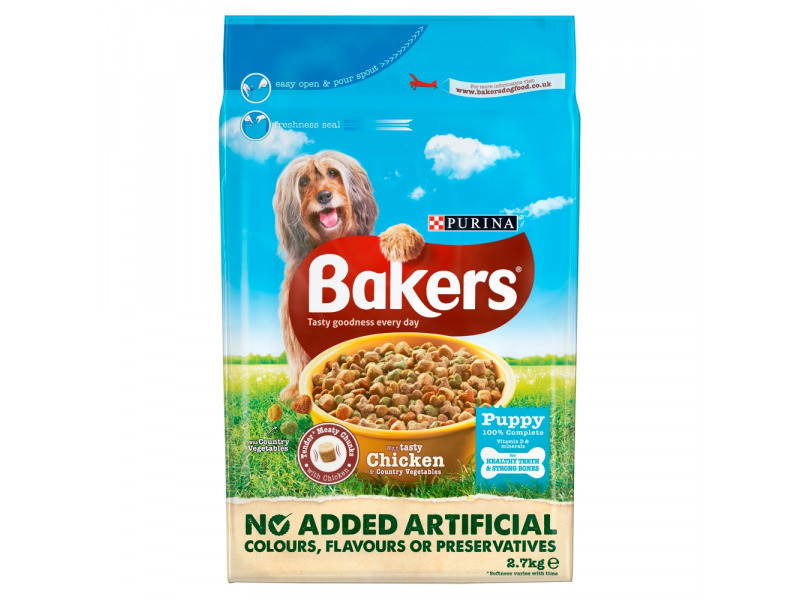 There are currently no questions for Bakers Complete Puppy Food - be the first to ask one!